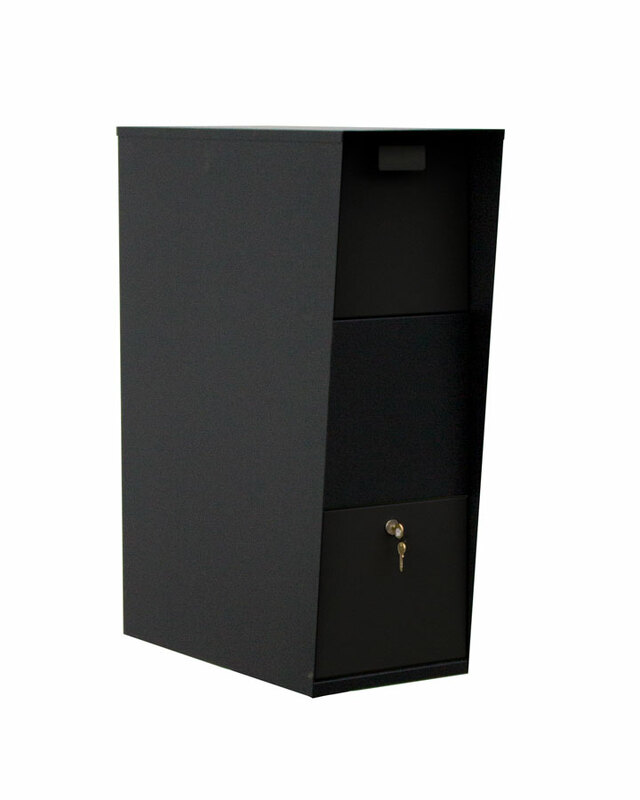 This large capacity security mailbox, made of durable powder coated 18-gauge steel, will keep weeks’ worth of mail safe. A hinged flap allows you to choose where your mail is delivered. For everyday use, put the hinged flap in the down position, so mail is delivered to the non-locking storage area. When you go on vacation, put the hinged flap in the up position, so mail drops down into the secure locked storage area. The sturdy hinged hopper door is large enough to accept small packages. The locked access door features a hook latch locking system that latches through the frame. The mailbox is labeled inside, providing simple, easy-to-follow instructions for the delivery carrier. Powder coated black finish. Dimensions: 10-1/4" wide x 29-1/2" high x 23" deep. Incoming Opening: 9-1/2" x 8" x 18". Interior: 20" x 10" x 18". Optional 4" x 4" in ground black post (2mm thick). Optional vinyl address numbers are available in white or gold.